Welcome to Acme Style's first "Bonus Store of the Month"! 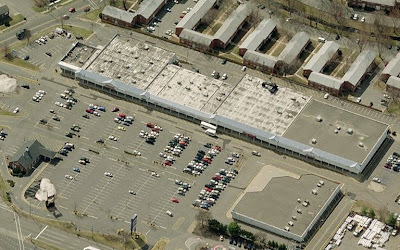 As much as I love Acme, I will, on occasion, feature stores from other chains with compelling architecture or history. Probably won't be posting one every month, but couldn't resist the title! 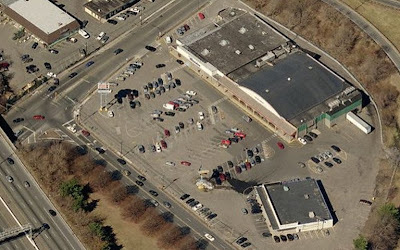 So let's start off with this Stop and Shop location just off of Rt. 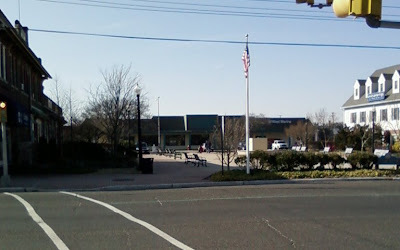 3 in Clifton NJ. 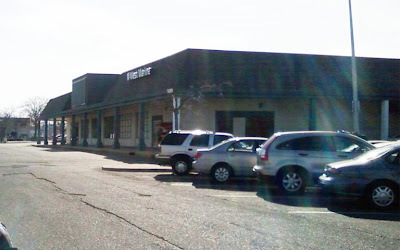 It is located about a mile up the road from a brand new Acme that will be making an appearance in an upcoming post. It is also located about 2 miles away from another very large Stop and Shop which has just been remodeled with S&S's new look... a look that I find absurdly generic and downright appalling. I think S&S is missing the mark with their new look but that's a whole other post. 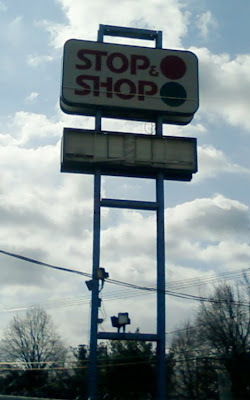 In the meantime... this store is being torn down so a new Super Stop and Shop can be built. Not good news for the Acme down the street. This store was a Grand Union for many many years. Not sure what it was originally. Stop and Shop acquired most of the Grand Unions when the chain went bankrupt in the early 2000's. The Stop and Shop about 2 miles down the road was an Edwards. 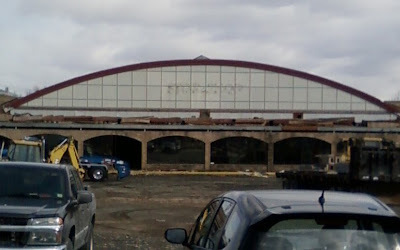 Both chains were owned by Ahold but the Edwards banner was retired with hopes that the Stop and Shop banner would more effectively draw business away from ShopRite and Pathmark. I don't thing Ahold had the level of success they were hoping for with the switch. The interior ceiling was not arched like the exterior. A drop ceiling had been added at some point. The windows along the front are very distinctive to Grand Unions. This section was added on during the chain-wide 80's remodel. Many locations received additions very similar to this. 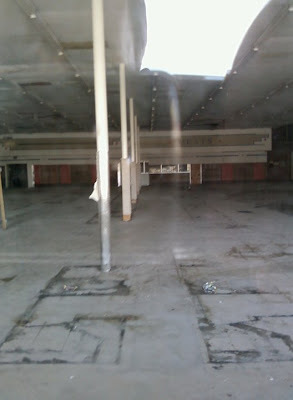 This store was remodeled again in the very late 90's. Grand Union was having tough times throughout the 90's but did manage to get a cash infusion from partnering up with another company. This money was quickly spent remodeling stores in hopes of saving the chain. This particular location received the deluxe remodel package and was among the nicest Grand Unions I had ever been in. The wall graphics, faux hardwood floors, color scheme, old fashioned/retro decor... all among the best of it's time. Unfortunately for Grand Union,these remodels didn't bring in enough extra cash to keep the company afloat. The company went under in 2001. Stop and Shop took over this location did little to the interior when it took over, rightfully so. Most Grand Unions were closed for just a few days as they were transformed to Stop and Shops. 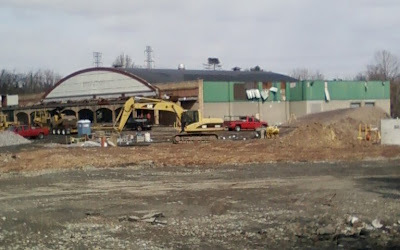 The big difference at this location was the front end where S&S put it's own, hideous green and red checkout stands where GU's stylish front end used to be. There is a trailer just to the right that is serving as the temporary Stop and Shop pharmacy. I don't remember this store having a pharmacy but I can't imagine new customers wanting to get their prescriptions from a trailer in the midst of the construction mess. So it must be for use of existing customers. 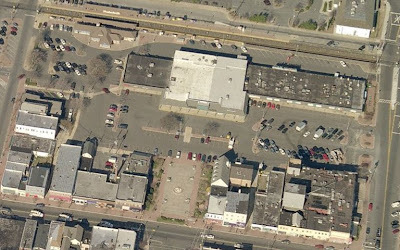 The Stop and Shop sign is all you can really see of the store from Rt. 3 as you are whizzing by. 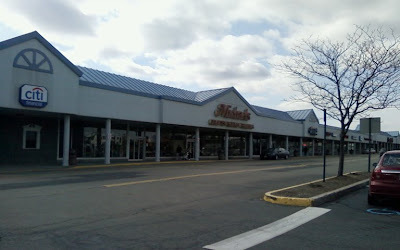 This Michaels Art and Crafts store located in the Morris Hills Shopping Center in Parsippany NJ is a former Acme location. 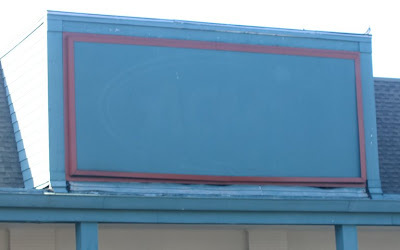 It closed in either the late 80's or very early 90's. The interior had the 70's colonial decor witht the fish-eye logo until the end. 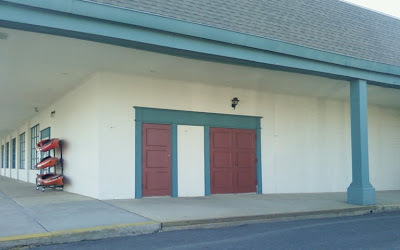 The facade of the shopping center was upgraded shortly before Acme closed. It was a small store with only 8 or 9 aisles. I believe it did have an in-store bakery which would be unsual for Acme's of this small size. 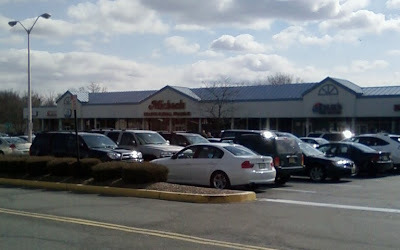 This store had fierce competition from a much larger Pathmark and ShopRite down the highway. In this shot you can see the cut out section around the Michaels logo where the Acme sign used to be. 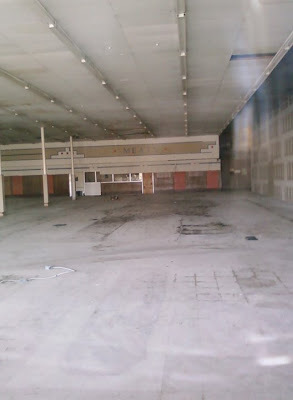 The doors to the Acme most likely were where the darkened windows are now. The framed window was used for posting Acme specials for the week. There is an identical one at the other end of the store. I have seen these windows on this style of Acmes at several locations but not with the type of frame which matched with the colonial decor of the interior of the store. 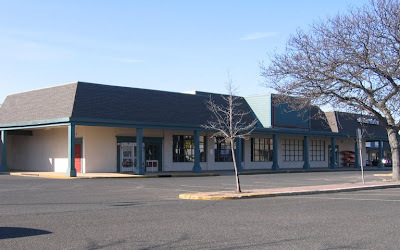 This former Acme is located on Main Street between 8th and 10th Avenues in the shore town of Belmar NJ. Just seven blocks in from the Atlantic Ocean. I am not sure when this store closed. Mostly likely in the early 2000's when Acme shut down many stores of this size all over NJ and PA. 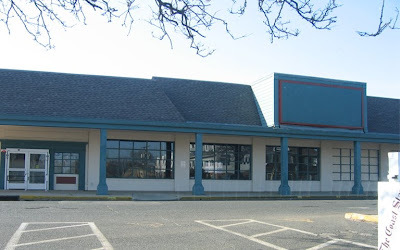 I have been going to the beaches of Belmar every summer since 2000 and was probably there when this Acme was still open. Thing is... I didn't know this Acme existed. Although it is on Main St it is set back about a 1/2 block and is not easily seen from the road unless you know it's there. Store fronts line Main Street blocking an easy view of the store except for a walkway right in front of the store. West Marine boating store has moved into the right side of the store. A shot from Main Street. It's looks quite open in this shot but as you drive along Main St you don't notice Acme unless you turn and look. There is a strip of stores to the right of the photo. The former Produce supply doors dressed up at this Acme since they are easily seen from the other stores. This Acme and many of it's characteristics are exactly the same to other stores built in this era which I am guessing to be the early 70's. The customer service office is directly across the foyer. 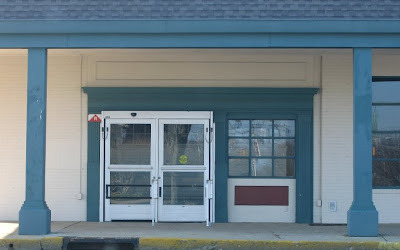 Shoppers turned right as soon as they passed through these doors. The office had windows to look out into the foyer... you can see them through the doors. The red oval logo... painted over! You can see it's still there if you look closely. This store was not remodeled in the 80's when Acmes switched from the fish-eye logo to the red oval. It's odd that this logo was changed since the facade of the store is original. 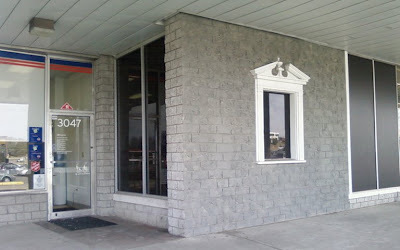 This store had the blue and beige convenience store wall graphics done in the late 90's. The orange and brown panels in the back are left over from the 70's colonial look. The odd thing at this location is that the floors appear to have never been upgraded. All beige. In the 70's, Acme's had white floors with a faux red and blue slate Produce floor, orange and brown along the Meat Department and gold and brown in the Bakery aisle. The wall to the right is where the boating store begins. Check out stand foot prints. The infamous railing. Every Acme had one in those days. The customer service office was off to the left. 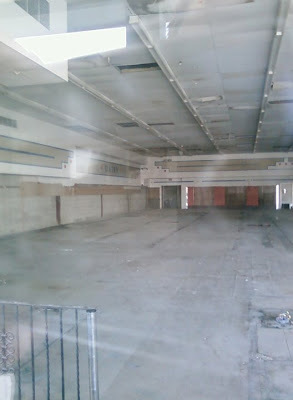 This looks to have been a very small store. Probably 8 or 9 rather short aisles. Below is a screen shot from Live Maps. 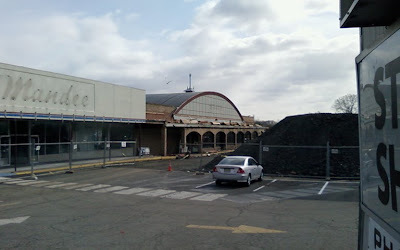 Shows how this Acme was buried out of view from just about every angle. Very limited parking in the shopping center. Must have been a nightmare when the Acme was just a little busy.